As parents who want to seek the things of God more than the things of this world, it’s tough to know what to say “yes” to in media. My husband grew up without a television. It broke when they were little. His parents saw their children were outside playing with their friends more, so they just never replaced it. I grew up watching T.V. with boundaries on what was allowed and not allowed. There were some shows that were completely off limits…like “The Smurfs”. (I had a friend who wasn’t allowed to watch “The Flintstones” because ‘Fred was selfish’.) On Thursday nights as a family we sat and laughed together at “The Cosby Show”. We loved going to movies as a family. My parents did a great job of teaching me how to evaluate a movie after we watched it to see how it lined up with our Christian worldview. For our own little family we had to decide how we would handle media. We own a T.V. We have cable. We even have Netflix through our Xbox. How do we decide what is acceptable and what is unacceptable to watch? We like to use the rule of “good, better, best”. A show may not have anything morally wrong with it (like “Yo Gabba Gabba”) but is it the better choice of the shows offered? Is it the best choice? We try to limit how much time our kids watch T.V. So if they only have an hour or so to watch T.V. in a day, I would rather what they chose to be the “best” choice. I try to give them the tools to decide that for themselves. You will often hear my 2-year-old ask if a show is “PG” or “scary”. We feel that a “better” or “best” show doesn’t use potty talk or words we don’t allow our kids to use. We try to make sure the behavior being modeled follows the rules of our house (Obey, Honor, Be Responsible). Do my kids still use potty talk? Of course. Have they seen some shows that may not be the “best” choice? Yes. In using the “good, better, best” system we attempt to minimize exposure to the behaviors we don’t want our children to emulate. For some families the “best” choice is no T.V. at all. For others it may be no cable. I think the key is defining for your family what your “good, better, & best” choices are. Being intentional about how you handle media exposure and attempting to spend a majority of time in the “best” choices. How do you handle media exposure in your home? Do you have set time limits or times of day they watch T.V.? Do you decide what shows they can watch? Do you discuss why you don’t watch certain shows? oh erin I totally understand those “seasons”. Of course I posted on this topic and the night before I post it my 2nd child is up most of the night sick. Now he is in bed with my iPad watching endless shows through Netflix. I totally think there are seasons (pregnancy, newborns, residency, holidays) that sometimes we just have to not be too legalistic with our media choices and give ourselves grace to just survive that season. I also think that it takes intentionality to come out of those seasons and not allow them to become habits…hard stuff. Thanks for sharing what’s been going on in your home right now. 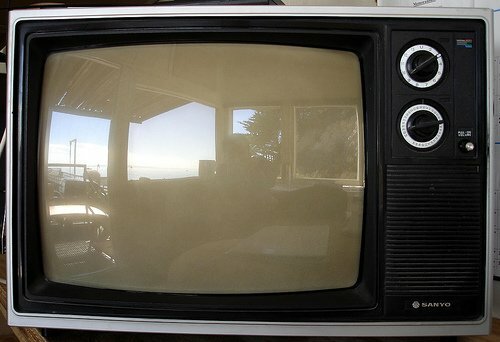 When I was a young teenager, my mom had our cable disconnected for “Turn Your TV Off Week.” In the midst of life, it just never came back and quite frankly we didn’t really miss it. In our own home, we have a TV for the Wii and DVD’s and we just signed up for Netflix, but I don’t think we’ll ever get cable. I will freely admit that I miss HGTV, The History Channel and The Food Network, but I love your “good, better, best” system and for us, the “best” is time spent with – my husband and I are currently working on limiting how many movies/shows we watch on Netflix and Hulu in an effort to spend more time in the evenings just being together. With a Dad who is a producer and my own background in audio production – entertainment tends to pull me in more than I care to admit – but I think your system gives me a great “take-away” to hold on to! Thank you for sharing! The totally turning off the T.V. always sounds so “scary” yet appealing. I like the idea of having it for DVDs and netflix. We considered cutting off the cable since the boys pretty much watch PBS & Netflix anyways…but we chickened out. I totally get the pull into entertainment. I love the theater and movies. A lot of my good family memories were laughing at and discussing movies. Thanks Alle for sharing!! I try to watch with my kids when they watch TV. If something isn’t appropriate that they are watching or if a character acts in a way that God doesn’t want us to, we talk about it as a family. I believe that my children will be exposed to bad choices in behavior whether they watch TV or not so I think if we can watch it together and talk about it and give them a chance to talk and figure things out ahead of time it helps them when they encounter this behavior in the real world. Thanks Amy for sharing! I think it’s great to watch together and talk about it. Giving them the tools to make these decisions for themselves will go a long way when they are out in the world by themselves…sooner than we realize! HI there, I’m new to your blog. I found you through Women Living Well. We got rid of cable in our home and we have netflix now. I think it’s good to have some television, just not 500 channels of it. I believe that it’s my job to expose my children to different things when I feel they are ready. I don’t want naive kids, but I do want kids who are pure for as long as possible. So, the little bits that they get are opportunities for us to talk about things. Plus, when you homeschool there really isn’t much time for television. I like Netflix because there are documentaries. Sometimes we use them for school. ie: I think it’s called creatures that defy evolution. There’s at least three documentaries that talk about how amazing various creatures are and how they had to be created and couldn’t have evolved. It’s pretty amazing. Anyway…my opinion is that some is good, too much is exactly that…too much! I feel like Erin. This is a busy season and Sam is working a lot. My work was consuming a lot of time and K has learned to work the remote on her own. So, in the morning I fell into a bad habit of letting her go turn on the TV first thing so I could sleep a little more. She would watch TV all day if I let her. We never had cable and pretty much only watch netflix. I am finding that now that she is almost 6 it is getting harder because she feels she has outgrown some shows like Dora and Diego and Little Einsteins that were safe and I find that the shows that typically come next have attitudes that I don’t like. I like your good, better, best approach and she is certainly old enough to be taking some responsibility for what she watches.